Endstille from Germany, plays ugliest aggressive Black-Metal with the speed of a MG42 firing and the power of heavy ship-artillery. 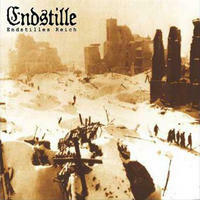 4 full-length albums pushed Endstille to the top of Germany’s Black-Metal scene. All big Festivals were played (Wacken, Summer-Breeze, Party-San, and so on…) and a european tour with Dark Funeral and Naglfar took place in 2006. They signed a contract with Regain Records in June 2007, Endstille is ready to conquer the world!